Editor's Note: This article, published in our August 2008 issue, includes information on .Mac, which will be replaced by MobileMe in early July. Any instructions may change significantly. Most people with multiple Macs need to synchronize more data than .Mac Sync can handle-such as word processing documents, spreadsheets, PDF files, e-mail messages, photos, videos, and music. If you’re a .Mac member (soon to be MobileMe), one approach is to put files you want to sync on your iDisk. Then open the Mac preference pane on each Mac you want to sync, go to the iDisk tab, and make sure that iDisk Sync is set to On (if it isn’t, click on the Start button). This creates a local copy of everything on your iDisk, which you can access even when you’re offline. As long as Update is set to Automatically, whenever you save a file to your iDisk, OS X uploads it to Apple’s servers and downloads it to any other Mac you’ve set up in the same way. If you’re not a .Mac member, if you need more online storage space than .Mac provides (10GB by default, moving to 20GB with MobileMe), or if you want to be able to access your files from your mobile phone, you can try a program that was still a beta release at press time: Sharpcast’s SugarSync (subscriptions start at $25 per year), which securely synchronizes your selected folder(s) to the company’s servers and to other computers you own. Evenflow’s Dropbox, also a beta release at press time, provides a similar service with an impressively simple user interface, and Jungle Tools’ JungleDisk can accomplish nearly the same thing using Amazon.com’s S3 service. 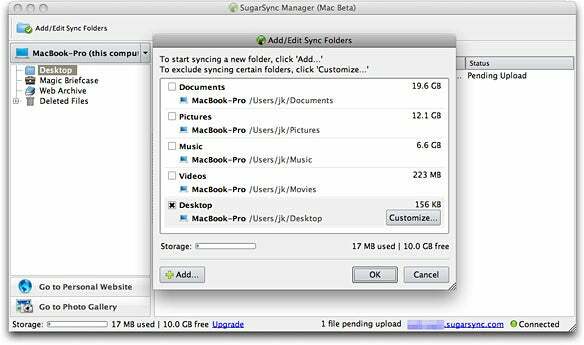 Select the folders you want to keep in sync, and SugarSync synchronizes them to the company's servers in the background. How Sync Utilities Work Almost all synchronization utilities have certain features in common. You specify two locations you want to synchronize-say, a folder on your laptop and the corresponding folder on your desktop Mac. Then you choose the direction of the synchronization: you might specify that files copy from the desktop to the laptop only, from the laptop to the desktop only, or in both directions (thus making sure both locations end up with identical contents). You may also have to decide what action the software should take when both locations contain a file with the same name but different contents-choices include overwriting the older file with the newer one, renaming one of the files and keeping both, and pausing to let you decide what to do on a case-by-case basis. After you set up your preferences and activate a sync, the software scans the files in both locations and copies just the ones that aren’t already the same in both places. Depending on how you set things up, the software may also delete files from one side that were deleted on the other, in order to make the two locations identical. Some synchronization software can perform syncs automatically on a schedule or when other trigger events occur, such as mounting a network volume. This can be useful, for example, if you want to synchronize your laptop with your desktop Mac every time you come home from a business trip and connect to your local network. Dozens of applications, including many backup programs, can do all this. Macworld has recently reviewed several: Econ Technologies’ $30 ChronoSync 3.3.6 ( ), Softobe’s $40 FoldersSynchronizer X 3.6.3 ( ), and Qdea’s $100 Synchronize Pro X 6.0.1 ( ); Qdea also offers the $30 Synchronize X Plus 3.5, which has many of the synching features of its Pro sibling). My favorite is ChronoSync, which has a wide range of options for customization and scheduling, and has been highly reliable in my testing. Synchronize Pro X lets you set up custom syncs or backups. Choose Which Files to Sync If both Macs have suitably large hard drives and if you do similar work on each, you might consider synchronizing your entire user folder (/Users/your user folder) between the two, as that folder likely contains all your personal files. 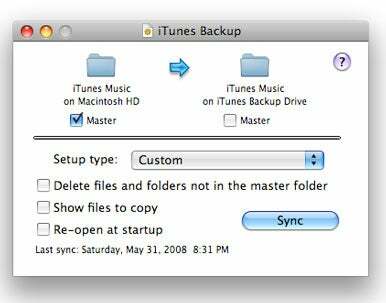 Because your user folder includes, by default, all your music, photos, and e-mail, not to mention the information included in a .Mac sync (contacts, calendars, and so on), syncing the whole thing can eliminate the need to come up with a separate strategy for each kind of data. However, syncing all your data in this way can be highly problematic-in fact, it can actually lead to data loss if you’ve used both computers between synchronization sessions: If you’ve changed database files (including those that Mail, Entourage, or iTunes uses), disk images (such as the ones that hold Windows installations for Parallels Desktop or VMware Fusion), or other similar files, one computer’s version of the file will overwrite the other’s, rather than specific data within the files being synchronized. Unless you know for sure that files will not change on either computer while the other is in use, it’s much safer to restrict synchronization to more-specific folders. If you normally keep the documents you create in your Documents folder or in one of its subfolders, syncing the Documents folder between two Macs is a reasonable choice. However, you may want to be more selective. For example, let’s say you use your desktop Mac for page-layout work in Adobe InDesign and store those files in Documents, but you never use InDesign on your laptop. You can save time and disk space by excluding the folder(s) for desktop-publishing documents from syncs. Or if you use your laptop mainly to edit Microsoft Office documents related to a particular project, you might decide to synchronize only the folder(s) you store that data in. Don’t Sync Applications Many applications store essential components outside of the Applications folder (for example, in /Library/Application Support and other Library subfolders, not to mention preference files), and chances are good that you’ll miss some of those pieces when you try to sync applications. The result could be malfunctioning programs on one or all of your computers. For more reliable operation, install applications on each computer separately. Test Syncs First Many sync utilities offer a test mode that lets you see what changes would be made during a sync, without actually copying any files. Checking out these sync scenarios ahead of time has saved me from losing files to user error more than once. For example, you can click on ChronoSync’s Trial Sync button instead of its Synchronize button, or you can go to FoldersSynchronizer X’s General preference pane and select Show Preview in the Before Sync section. Delete with Caution When performing a bidirectional sync, as you most likely will when synchronizing two computers that are both used actively, sync utilities let you specify whether to delete files that have been removed from the other side. This may be what you want, but it could also result in the loss of important data if you have a preference set incorrectly or if you delete a file by mistake. At least for the first few runs, until you’re comfortable with the way your synchronization works, choose a setting that moves deleted files to another folder or asks for your approval before deleting them. Sync Selectively In some situations, you won’t want to synchronize all your important files between both of your Macs. For example, you may not need many of the files in your desktop Mac’s Downloads folder to be transferred to your laptop-especially if the laptop is short on disk space.